Emergency hospital during 1918 influenza epidemic, Camp Funston, Kansas (source: National Museum of Health and Medicine, AFIP). A bout of the flu can be mild. In young, healthy adults, many infections pass unnoticed. But sometimes the influenza virus evolves into a strain that decimates its victims. The worst known strain swept the world in the Fall of 1918, infecting 500-1000 million and killing 40-100 million, about 2-5% of people. There are several theories about where the pandemic began, but the likeliest origin was in Haskell County, Kansas, in the United States. People in the sparsely populated county, where farmers raised pigs, poultry, cattle, and grain, began suffering from influenza in late January 1918. Unusually for flu, it was young, healthy adults who were hardest hit. Victims fell ill suddenly, many progressing to pneumonia and dying, often within days. Within weeks, however, the epidemic ended. The natural geographic isolation of this community normally might have contained the fatal flu in a sort of unintentional quarantine, but the First World War intervened. Men were uprooted from their home towns and congregated in huge numbers in army camps for training and then shipping out to other camps or to fight in Europe. The destination for men from Haskell County was Camp Funston, part of Fort Riley, Kansas, where the first influenza case was reported in early March. As soldiers moved among camps, the virus spread. 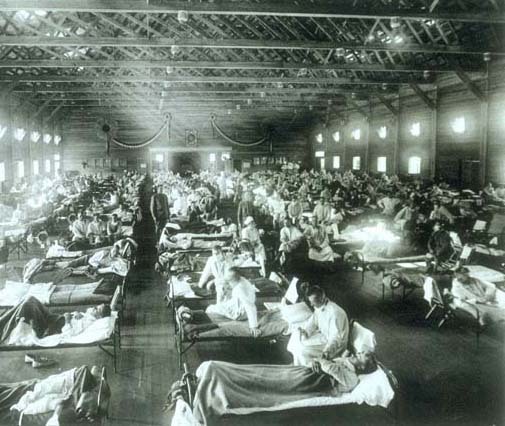 Within two months, the epidemic spread to most of the army camps and most of the largest cities in the United States. As American soldiers went to France, so did the virus, spreading first from the port of Brest. The disease started with cough, then headache. Temperature, breathing and heart rate increased rapidly. In the worst cases, pneumonia came next, the lungs filling with liquid, drowning the patients and turning them blue from lack of air. Patients bled from every orifice: mouths, noses, ears, eyes. Those who survived often suffered temporary or permanent brain damage. Several million developed encephalitis lethargica, in which victims were trapped in a permanent sleeplike and rigid state, as portrayed in the 1990 movie “Awakenings.” In others, normal thought processes were impaired. During negotiations to end World War I, US President Woodrow Wilson was struck with flu, and people around him noted that his mental abilities never fully recovered. The French leader George Clemenceau had wanted harsher punishment of Germany than Wilson had desired. Clemenceau may have convinced Wilson in his weakened state to accept such harsh terms, which may have been one of the factors causing World War II. Since flu is highly contagious early in the illness, even before symptoms appear, strict quarantine may be necessary to stop its spread during an epidemic. Australia kept its 1918 flu death rate relatively low by enforcing quarantines. However, in many parts of the world, public health officials hesitated to impose such measures, giving the disease time to gain a foothold. In the US city of Philadelphia, a rally of half a million people was planned in September 1918 to sell bonds to fund the war, at just the time when the flu started to infect residents. Although doctors warned the public health director to cancel the rally, he wanted to meet the city’s quota to raise money for the war and refused to cancel the event. Within days after the rally, half a million city residents caught the flu. Why was the 1918 flu so deadly? The influenza virus wasn’t preserved at the time of the outbreak, at least on purpose. But in the late 1990s researchers Ann Reid, Jeffery K. Taubenberger, and their colleagues extracted and sequenced the genetic material of the virus, RNA, from tissue of victims who died in the pandemic. They used bits of lung that were preserved in formalin from victims on army bases or from victims buried in permafrost in the Alaskan village of Brevig Mission, where flu killed 85% of adults. Comparisons with known flu viruses in humans, pigs, and birds suggest that some genes of the 1918 virus came from birds or an unknown animal source. Other scientists then were able to show that the amino acid sequence of hemagglutinin protein from the 1918 virus had several changes from other flu viruses that may have helped it to easily bind and invade human cells, and that made the virus look different enough from earlier flu virus strains that people had no immunity.